The Pentagon has approved a request from the Trump Administration for U.S. soldiers to extend their mission along the southwestern border in order to hang concertina wire and assist with surveillance, officials said on Monday. In a statement, the Department of Defense said the assistance would be granted through the end of September. 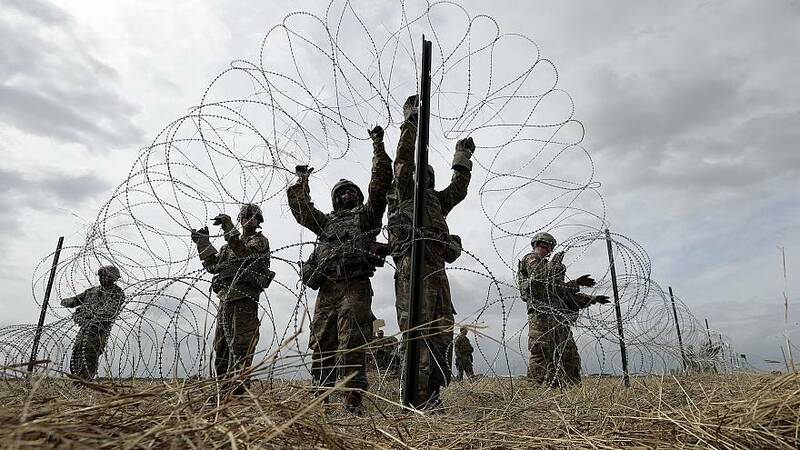 The Department of Homeland Security had asked for more military engineers to install the concertina wire on top of 160 miles of already existing fencing, as well as additional aviation support, medical personnel and surveillance equipment. In Monday's statement, the Pentagon said troops would transition away from "hardening" ports of entry in order to assist with mobile surveillance and detection, aviation support and concertina wire replacement between ports of entry. President Donald Trump deployed more than 5,000 troops to the border in October, in anticipation of the arrival of a so-called "migrant caravan" — an order that was set to expire on Jan. 31. The president has suggested that the number of troops involved in the operation — dubbed "Faithful Patriot" — could rise to 15,000. It wasn't immediately clear how many troops would be sent and whether they will be active duty or National Guard troops. The Pentagon's approval came as a partial shutdown of the federal government over a border wall stretched into a fourth week. The president has refused to approve a spending bill that doesn't include funds for a wall, which Democratic leader Nancy Pelosi has described as an "immorality" and "an old way of thinking."